A summary of today’s show: Fr. 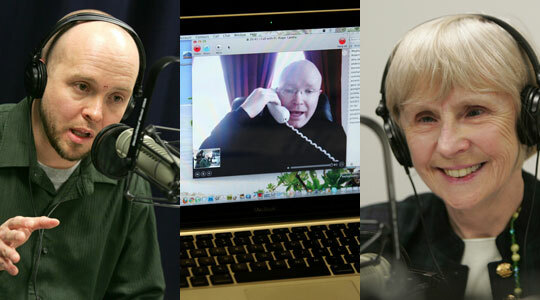 Roger Landry and Gregory Tracy join Scot and Susan to discuss how the tragedy in Japan as a reminder for prayer and to consider God’s mercy; they discuss the significance of the Rite of Election and the preparation to receive new members of the Church; the Massachusetts bishops ask Congress not to cut home heating oil assistance and how that affects the dignity of the person; and who is the real St. Patrick? 1st segment: Scot welcomes Susan to the show and they discuss St. Patrick’s Day. Susan shared what she heard in the homily at Mass this morning at the Pastoral Center. Fr. Bob Oliver talked about the Breastplate of St. Patrick, and that if St. Patrick felt the need for armor in his ministry to protect him, then perhaps we shouldn’t domesticate him too much. Scot said that the theme song for The Good Catholic Life is “St. Patrick’s Breastplate” by Martin Doman. He wrote it as the theme song for the 2007 Boston Catholic Men’s Conference. 2nd segment: Gregory Tracy and Fr. Landry join Susan and Scot. The situation in Japan is one of most significant tragedies and calamities of our lifetime. Greg reflected that so many are overwhelmed by the scenes, the videos of the tsunami devastating everything in their path. It recalls for him how powerless we are in the face of the forces of nature. It takes these disasters to remind us that man is not the ultimate force in the world. One of the Japanese bishops said that life is a gift of God and is in the hands of God. Fr. Landry said it is difficult to watch every night to see so much suffering. It is hard to see other people like us to suffer so much. As a pastor, he tries to convert that sorrow into prayer. We know that this life isn’t all that there is and even though we might die tragically, it doesn’t mean that life is over. We pray for those who died and their loved ones. That is how we respond as Catholics. He is pleased that Cardinal Sean and Bishop Coleman in Fall River have authorized collections to provide for the physical and monetary needs in Japan. We can let them know that in the midst of charity they are not alone and that the love of people from across the world is stronger than a tsunami, that the radiation of Christian faith is stronger than nuclear radiation. Most parishes will take up the collection either this Sunday or the next. Scot had no doubt that Catholics in the region will be as generous as they always are when such collections come up. Fr. Roger is always pleased that in his inner-city parish so much is raised for these collections. Scot said that he’s always felt that it is better to donate to a Catholic organization to show how we as a Church respond. Susan said that she remembers reading an assessment of relief organizations and Catholic Relief Services was highest rated as the one in which the most pennies per dollar reach the people on the ground. People often ask, “How could God let this happen?” Fr. Landry said that such disasters are never positively willed by God, but the best explanation was Salvifici Doloris, in which John Paul II said suffering causes us to become Good Samaritans, it unleashes love. We can’t stand on the sidelines. It forces us to become who we really are in sacrificing for others. If we believe in an afterlife with God, we can’t absolutely say death is a tragedy. The Caritas director in Japan said there is now an opportunity to witness to the truths of Catholic faith and Catholic love. Greg said in a country that’s not necessarily a Catholic country, it shows that the Church is there witnessing to the value of all human life, that we’re concerned for everyone, not just Catholics. Susan said it also answers the question, “Lord, who is my neighbor?” In a global community, it is a person half a world away. 3rd segment: On the front page of tomorrow’s Pilot is last Sunday’s Rite of Election at the Cathedral of the Holy Cross, in which those preparing to be received into the Church at Easter are welcomed by the Cardinal. On this past Sunday, there were two ceremonies in order to accommodate them all and their families. In Boston, there were 600 catechumens, nationally there are 150,000. Susan said this is the evidence of the universal Church. At the Rite of Election, you see people from every continent, of all ages. Greg was there and shared what he saw as a photographer. He said it was beautiful to see the catechumens, those who are unbaptized, and the candidates, baptized Christians who are going to be received into full communion with the Church. The front-page photo of the Pilot is of a 10-year-old boy who signed his own name into the book of Election. There is a catechumen or a candidate and behind them always comes a family or someone else who is guiding them into the faith. Fr. Roger described the preparation of the catechumens and candidates leading up to the Easter vigil. At the liturgies, they will receive scrutinies to help them determine their intentions and to stoke their desire to become not just Catholic, but good Catholics. Fr. Roger said at his parish that he’s interviewing each person and continuing with their education in the faith. He pointed out that we don’t give 25 years of instruction in 3 months time, but give them the basic foundation to understand that we trust in Christ and trust in what Christ did and in His Church and what it confesses. These are intense times for them as they examine their own intent and bring up any questions for discussion with those helping them on their journey. Susan said the renewal of baptismal vows on the Easter vigil by the whole Christian community is a very important participation in the ceremony of reception of catechumens and candidates into the Church. Of course, we reject Satan and his evil works, but the renewal asks us to reflect on what form those evils take in our lives. We ought not answer too glibly, but deliberately. “This is a 20-year journey for me — something I’ve always wanted do.” Elpers was raised in a non-religious household and never baptized. … The only times Elpers attended Mass was if she went with friends, and before having a family of her own, the only time she attended was on Christmas and Easter. She said attending Mass without being able to fully participate was difficult for her, but she wanted to learn more abou the Mass. “I didn’t understand what I was missing and what they were a part of,” Elpers said. Elpers said she even attended other Christian churches at times, but she was most drawn to the Catholic Church’s history, tradition and Mass. “There was something so special about the Catholic Mass for me,” she said. We pray for all those preparing to come into full communion with the Church and those helping them to prepare. 4th segment: Discussing a letter sent this week by the bishops of the 4 dioceses in Massachusetts to congressional leaders on proposed cuts to the Low Income Energy Heating policy. It would cut heating assistance from $5.1 billion to $2.7 billion and would hurt the Northeast disproportionately. Scot said the four Mass. bishops rarely put out a common letter and this shows this to be a significant issue for them. Greg said that the cuts are a drop in the bucket for the deficit. Meanwhile, heating oil is mainly used in the Northeast, while virtually everywhere else only natural gas is used for heating. Ten years ago, heating oil was 78 cents per gallon and this year it’s up to $4 per gallon. The Church is always on the side of the most disadvantaged, the poor. Our plea is that, when considering how to navigate through this difficult budgeting process, Congress preserve a special place and regard for the most vulnerable of our citizens, particularly those whose precarious economic circumstances force them to choose between shelter and clothing or between heat and food. There can be a vibrant debate over what form that care can take, whether it’s through federal government or local government or a non-governmental solution, but there must always be a conscious regard for how those people will be taken care off. It is callous to say we’re going to cut the budget by 50% without considering how the vulnerable are being left even more vulnerable. Susan said the bishops remind the government how much the Church does in social services, but also say the Church can’t do it alone. Also, twice in the letter they talk about the dignity of the human person. 5th segment: Welcoming Justin Bell to have a conversation about St. Patrick. Justin has been speaking in various venues on “who is the real St. Patrick,” after having produced a documentary on Ireland that included a look at St. Patrick’s life in the life of the Irish people. St. Patrick was a real person born about 373, his father was a deacon and his grandfather was a priest. He lived a comfortable life, was well-educated, and a Roman citizen. He was kidnapped by pirates at 16 years old and sold into slavery in Ireland. He was a captive for 6 years and had a huge conversion experience. At 21 he escaped and went to Europe where he studied and prayed. At the age of 30 he received a vision in which he received a letter entitled “the voice of the Irish” and he heard the people of Ireland asking him to return to walk among them. This became his sacred calling, to become an apostle to Ireland. He didn’t go back right away, but spent 30 more years preparing for his mission. Scot noted that even St. Patrick hadn’t even done much by the age of 30 and this can be a lesson for young adults. Justin agreed that God prepares us in the present moment and young adults are too often looking ahead to something else rather than living in this moment. Scot said devotion to St. Patrick can be intense, but is often missing from St. Patrick’s Day celebration. St. Patrick is not about binge drinking and carousing. The way we should celebrate him is to learn more about his life and his mission for us. Justin’s idea for his documentary was to profile different Irish people’s lives as an expression of Irish life and culture, but interwoven with the life of St. Patrick. The name of the documentary is “Seven Shades of Green.” One of the people he interviewed is a Nigerian immigrant who had been elected as the first black mayor in Ireland. The saints are alive today and they are interested in our lives and we can pray to them, Justin said of the lessons he’s learned in his study of Patrick. Susan said she marked St. Patrick’s Day growing up, but it was very home-centered. Always starting with Mass, then a corned beef and cabbage meal, and wearing green, but her grandfather had come over in the famine and they were very much aware of the sacrifices of the Irish. Justin recalled the term the Green martyrdom, referring to so many Irish missionaries and priests who went out from Ireland, bringing Christ around the world, but never to return home. Scot said one way to model oneself after St. Patrick is to be a missionary and even in the Boston area where so many are nominally Catholic, this is a place ripe for missionary activity. Scot said it was the Irish priests who came to Boston in the early years of the Church in this area that grew the Church so large and the Irish immigrants who laid the foundation. We can only claim St. Patrick as a patron to the extent that we are missionaries. The documentary is showing at the Watertown Public Library next Tuesday. Justin said the reception to it has been very good because it engages the audience in real people’s lives. Scot then mentioned that Cardinal Sean and Bishop Arthur Kennedy announced the launch of the Theological Institute for the New Evangelization at St. John Seminary. They will be discussing the new institute next Tuesday on The Good Catholic Life when Fr. Chris O’Connor, who has been named president of the institute, will be co-hosting.